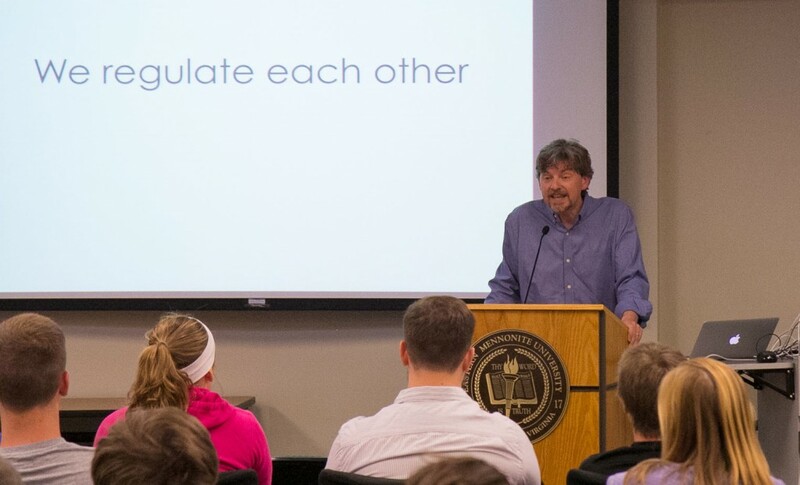 During a recent lecture at Eastern Mennonite University, James Coan, PhD, demonstrated why his work has been widely featured in both the academic and popular presses. Coan, associate professor of clinical psychology and director of the Virginia Affective Neuroscience Laboratory at the University of Virginia, struck a playful yet serious tone while discussing his groundbreaking study of how relationships affect emotions. “We don’t electric shock children. Even I wouldn’t do that,” Coan reassured the audience, with an infectious laugh. At EMU’s 2011 Attachment Conference, Coan delivered a keynote address entitled “The Social Regulation of Emotion.” That presentation was published as a chapter in the conference book, Integrating the New Science of Love and a Spirituality of Peace: Becoming Human Again (Cascade Books, 2013). On March 10, 2014, Coan brought his chock-a-block Powerpoint slides back to EMU for another entertaining, anecdote-filled lecture about his neuroscience research on how simply holding a loved one’s hand can regulate stress in threatening situations. In his lab, Coan shows subjects threat cues on a screen that indicate a one-in-five chance of receiving a small electric shock to the ankle. Using an MRI scanner and cutting-edge brain-mapping tools, he and his colleagues observe blood flow through various regions of their brains when exposed to this threat of pain. These threat cues and shocks are administered under three conditions: with the subjects alone, while holding the hands of strangers and while holding their spouses’ hands. Coan and his team of researchers found that holding a loved one’s hand during stressful and threatening situations causes a big decrease in the response to threat when compared to being alone or holding a stranger’s hand. In cases when their subjects, reassured by a spouse’s presence, showed a decreased threat response, Coan and other neuroscientists expected an alternate sector of the brain to “light up.” Curiously, however, they found that no other area of the brain was doing this. This suggests, Coan says, that an expected function of the test subject’s brain was being “outsourced” to another person. He saved the “weirdest” (his descriptor) bit for last as he postulated what folks from the world’s religious traditions will readily affirm: The “self” is extendable and dynamic, distributed and malleable, and most at home when connected to a healthy community. The significance of Coan’s research, says Christian Early, professor of philosophy & theology, is its suggestion that life “is much less daunting … in a community in which you can trust that people are there for you in a moment of need.” The bright side of community in the Anabaptist tradition – “sending help to a far corner of the world or a sign-up list for bringing meals to someone who has fallen sick” – is, however, not the complete picture. His visit was co-sponsored by Shenandoah Anabaptist Science Society and EMU’s master of arts in counseling program.